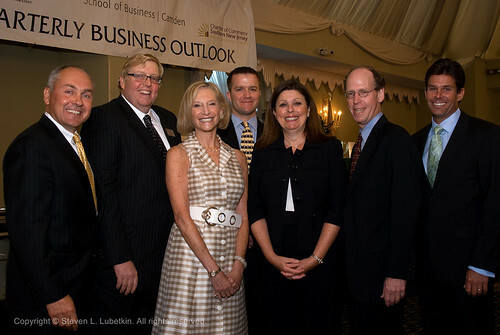 Professional Podcasts, LLC, the Internet broadcasting subsidiary of Lubetkin Communications LLC is pleased to present the Third Quarter 2010 Rutgers University School of Business at Camden Quarterly Business Outlook. This program was recorded on Tuesday, July 20, 2010, at the Crowne Plaza Hotel, Cherry Hill, NJ. Panelists posing before the program, were (from left): George Sowa, executive vice president and senior managing director, Brandywine Realty Trust; Peter Spirgel, managing partner of Flaster/Greenberg, the presenting sponsor for the Outlook; Maxine Ballen, president and CEO of the New Jersey Technology Council; Luke A. Tilley, regional economic adviser, Federal Reserve Bank of Philadelphia; Deborah DiLorenzo, president and CEO, Chamber of Commerce of Southern New Jersey; Rayman Solomon, acting executive dean, Rutgers-Camden School of Business, moderating his last Quarterly Business Outlook; and Greg Charbeneau, vice president and executive director, Adventure Aquarium, Camden. In 2010, we are supporting production of this program by offering the complete hour-long podcast through a pay-per-download service.